The articles here at Sprout Insights are written to keep you informed about ways to improve your social media presence. But beyond this publication, Sprout Social has tools that help you track and control that presence. Many of Sprout Social’s features are intended to improve your social media communications with customers, but that’s not all the tool can do. In fact, it has some powerful capabilities that can keep your departments and teams more connected. Especially in the fast-paced world of social media, it’s essential for your brand to have a reliable system for communicating internally as well as externally. Here are just a handful of examples of the ways that different departments within your company can stay in touch about social media duties through Sprout Social. If you aren’t using Sprout Social yet, you can get a taste of the tool’s collaboration features by signing up for a free, 30-day trial. 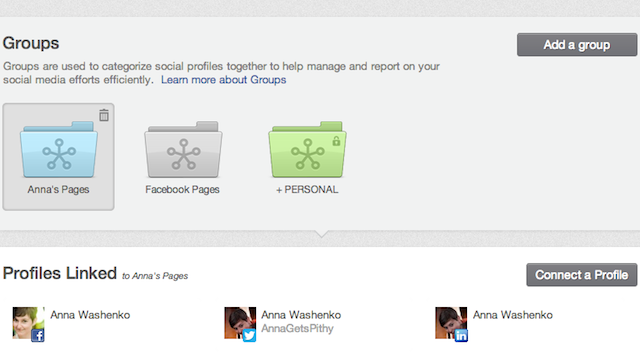 One of the most important elements of Sprout Social is the ability to create groups. This gives businesses of any size the ability to stay connected and informed about relevent social media profiles. For example, a company could create a group based around LinkedIn profiles that includes its HR team and maybe some members of upper management. That would let the necessary people focus on the networking and headhunting side of the business. Or for a large business with separate Facebook and Twitter accounts to field customer support inquiries, a group that includes those profiles and includes some community managers as well as the service team will make sure those problems are addressed efficiently. The benefit to groups is that they have access to all of Sprout Social’s other features — the Smart Inbox, RSS feeds, and reports to name a few — without getting cluttered with irrelevant information. That means you can have a master group with all of your key players for upper-level collaborations, as well as more focused ones for day-to-day duties. 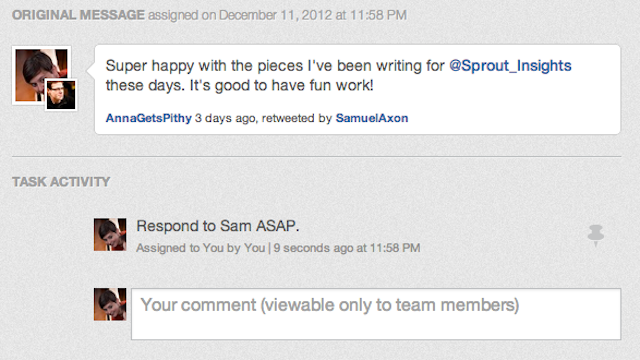 Once you’ve created groups, the main collaboration tool in Sprout Social is tasks. Any social media message can be turned into a task by clicking the pushpin icon. You can assign it to any connected team member, or to yourself. The list of team members in the group is shown on the far right of the screen, along with whether or not each of them is online. You can leave a comment along with the assignment that all group members will be able to view. Once the task is created, the assignee gets an email informing them of the needed job. It’s a simple enough feature, but has countless uses. Your social media manager, who should see all the posts related to the company, can use tasks to alert other employees when they need to chime in on a conversation. For example, he or she can create tasks to notify salespeople when somebody expresses interest in the brand or when he or she stumbles across somebody who could be a potential customer. The social media team isn’t the only group that can benefit from tasks. Other members of your staff in any group can keep an eye out for important tweets and posts in the Smart Inbox. That means the PR team can tell the CEO when he or she should weigh in on a conversation from their personal account. Or the customer support crew can alert each other when a satisfied customer giving a shout-out should get a personal response. 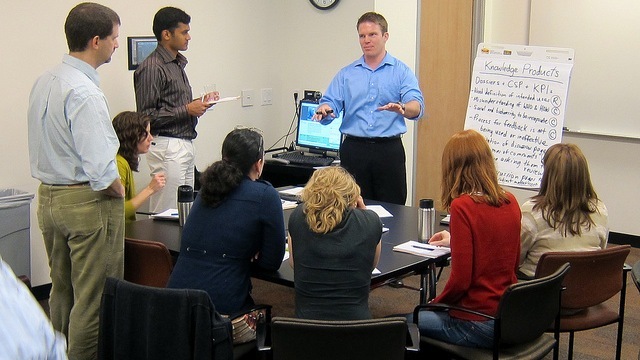 You have countless options for leveraging the groups and tasks to best serve your company. 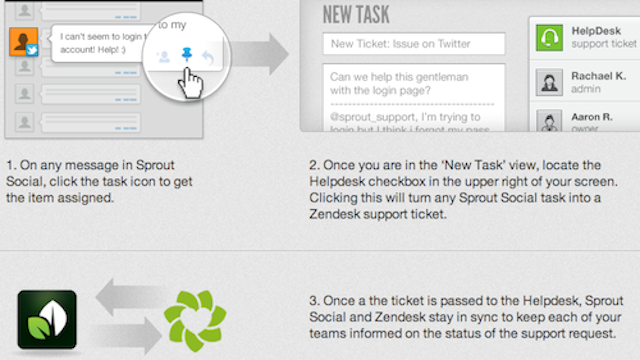 As we’ve discussed previously, Sprout Social has partnered with both ZenDesk and UserVoice to streamline the process of turning social media conversations into customer service tickets. Your teams can take full advantage of these parnerships from within the tool. Especially for companies that handle a large volume of customer inquiries and troubleshooting, this can be an invaluable addition to Sprout Social’s existing features. Your team and your clients will benefit from an easier process of handling support issues. To try these and many other features, sign up for a free trial of Sprout Social and let us know what you think. This article discusses Sprout Social, our social media management tool for businesses. To learn about our editorial ethics and our commitment to objective coverage of the social media space, visit our About page.